Dogue de Bordeaux is an ancient breed whose history is more legend than fact, as written records are nonexistent. What is known, however, is that these early dogs were incredibly versatile. At various times during their early history, they were used as protectors of homes and businesses, as guardians for livestock, and as herding dogs. They also hunted and were prized for their ability to hunt boars. 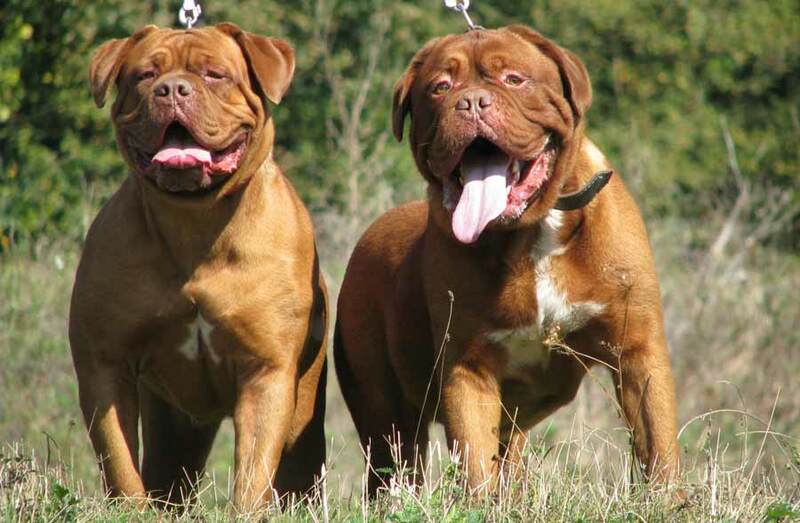 Dogue de Bordeaux dogs were fighters, too, and were used to bait bears, bulls, and big cats. The Dogue de Bordeaux was popular in France in the mid- to late 1800s. There were three varieties: the Toulouse, the Paris, and the Bordeaux. The modern Dogue de Bordeaux has the genetics of all three types, but most experts feel that today’s Dogue de Bordeaux dogs are primarily Bordeaux. During the French Revolution, the breed almost disappeared, as it was associated with royalty and the wealthy. Dogues de Bordeaux were virtually unknown in the United States until 1986, when Touchstone movies released the movie Turner and Hooch. The co-star, “Beasley,” was a handsome red Dogue de Bordeaux who drooled copiously in the movie and destroyed everything he touched. Today’s Dogue de Bordeaux is a very large, Mastiff-type breed standing between 22.5 and 26.5 inches tall and weighing 90 to more than 100 pounds. The head is very broad, with a short muzzle and small dropped ears, and the expression always appears to be scowling due to facial wrinkles. The chest is wide and deep, the body is strong, and the legs sturdy. The tail is long. The Dogue de Bordeaux coat is short and smooth and can be any shade of red or fawn. The Dogue de Bordeaux dog breed’s coat is easy to care for and requires brushing once or twice a week. Dogs with deep wrinkles on the face will need those wrinkles cleaned regularly. The Dogue de Bordeaux is not a high-activity breed but does need regular exercise. Many, especially puppies, can be quite playful, although adults are calmer and more dignified. This breed can run but is not a long-distance runner; instead, they do well at activities where they can use their strength, including carting and weight pulling. Early socialization is very important, as this is a watchful, protective breed. Training should begin during puppyhood so that the Dogue de Bordeaux puppies grow up understanding household rules and social manners and is well-versed in basic obedience skills. This is a powerful dog who can, if she wishes to, overpower her owner. Although normally calm, affectionate toward her people, and quiet, the Dogue de Bordeaux is also naturally watchful, protective, and powerful, so she needs an owner who is in complete control; training can help achieve that. Dogue de Bordeaux dogs need experienced owners, as they can be quite dominant and pushy and will take advantage of an inexperienced or passive owner. They are good with children when raised with them. They may not, however, be good with strange children and may interfere if the kids’ play gets too rough. They are often dog-aggressive. The breed does drool and can drool a lot, especially when the dog is anticipating a treat or meal. Health concerns include breathing problems, bloat, torsion, thyroid problems, mange, and hip dysplasia. Share your Dogue de Bordeaux story. Note: Upload only Dogue de Bordeaux picture or your picture with Dogue de Bordeaux below - spammer's ip may be blocked. The Dogue de Bordeaux is quiet, calm, and relaxed — until aroused. Don’t be lulled by his bulk. He can be surprisingly athletic and agile when necessary. This is not an apartment dog. To stay fit, he needs some space and moderate daily exercise. But more than anything else, he requires personal interaction. Picture that massive body trying to settle itself onto your lap and an enormous tongue swiping across your face. Dogues love to be an integral part of your family. Dogue de Bordeaux puppies should be friendly and trusting, and with proper socialization, become reserved and discriminating as they mature. As with all mastiffs, socialization is an absolute requirement to avoid either aggression or shyness. Animal aggression can be a problem; most Dogues will not start fights, but they will surely finish them. This stubborn breed is inclined to do things his own way, but he will respond to early, consistent training that includes firm leadership, cheerful praise, and food rewards. The Dogue de Bordeaux has an astonishing talent for snoring, sliming, and drooling. Slobber towels should be high on your list of canine accessories.